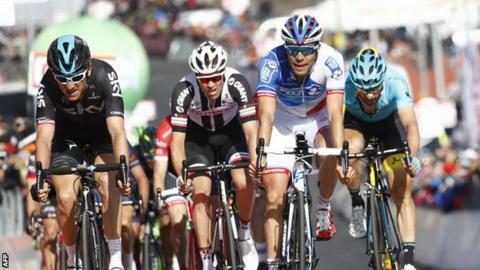 Team Sky's Geraint Thomas moved into second place in the Giro d'Italia by finishing third on stage four. The Welshman is six seconds behind Quick-Step's Bob Jungels, the fourth man to lead the race, and four seconds ahead of fellow Briton Adam Yates. Orica rider Yates was eighth on Tuesday's 181km stage, which finished on Mount Etna. Slovenia's Jan Polanc, who rides for UAE Team Emirates, won the stage having broken away after just 2km. Katusha's Ilnur Zakarin was second, 19 seconds back, before Thomas outsprinted FDJ's Thibaut Pinot. Wednesday's stage takes the riders from Pedara to Messina, with the three-week race concluding in Milan on 28 May. "There was a bit of a headwind in the last 2km so everyone was a bit of apprehensive. I felt good and obviously it was nice to win the sprint for the third [place] and get a few seconds as well. "I felt pretty good on the climb but, with it being a headwind, everyone like myself didn't really want to go too early. "I think everyone's still finding their legs and sussing each other out but a good start. "It's a nice sort of psychological boost winning the sprint but there's still a long way to go until Milan [the final stage], and we'll know a lot more on Sunday."